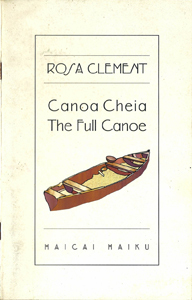 Rosa Clement is one of the leading voices in Brazilian haiku, but her work has been known around the world since her first appearances online more than two decades ago. This early volume (Helionaut Press, 2001) offers poems in both Portuguese and English. Haiku featured in the Book of the Week Archive are selected by Jim Kacian, and are used with permission. Enjoying Rosa’s haiku very much!